Bringing Art into your everyday! Announcement Personalized mini ski and snowboard ornaments, photography and graphic art infused into aluminum, coasters, wood , pot holders, and more! Personalized mini ski and snowboard ornaments, photography and graphic art infused into aluminum, coasters, wood , pot holders, and more! 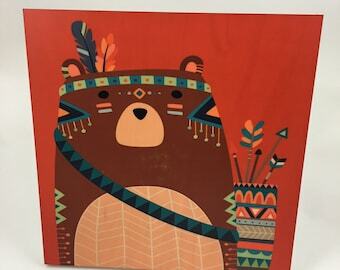 I Love my Tribe Animal group 6x6 hardboard standing or wall graphic tile. Colorful graphics for your homr decor. Raccoon photo bomb Woodland Animal 6x6 hardboard table or wall graphic print. Woodland Animals 6x6 hardboard table or wall graphic print. I have been a photographer for many years and have acquired a large array of subjects that now along with my graphic art designs has become "Hipsy Gypsy Designs". I wanted to put my talents to use making and creating cool cuff bracelets, ornaments and wall art , all printed on aluminum, wood, fabric and more. It's a great way to show my work in a contemporary way. I spend many hours at the computer putting together the best of my work and also enjoy traveling around in my vintage camper, hiking, snowshoeing, and taking pictures every chance I get. I live in Colorful Colorado and the great outdoors is at my door steps! I hope you take to look at my sites and find the gift that's right for you. Photographer, Maker,Graphic Art Designer, Creative and Fun loving person! Bringing Art into your everyday life! Photography + Graphic design, Bottle Openers, Personalized Ski + Snowboard Ornaments, Wall Art , coaster sets, Jewelry, Pot holders, Baby Bibs and lot's more!